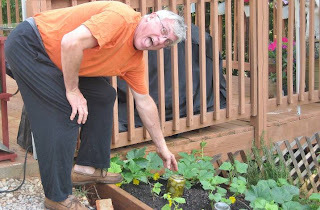 Here is my little garden plot, devoted to my son-in-law’s pickle supply. As you can see, some are already finished. Since I’m growing the pickles I think why not grow the jars too. I plant pint jars and already some have grown into quart-size. Oh look, one is filled with pickles already. 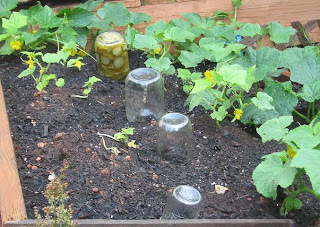 Putting up your own sweet and tangy pickles is a good idea since you control the ingredients and can tweak the spice amounts to your taste. For instance, try star anise or a cardamom pod in a batch if you like. Here is the way I do it. Place the sliced cucumbers, the canning lime and the cold water in a big stainless steel bowl. After the 24 hour period, drain the cucumbers and rinse well. There is a certain sequence to this pickling procedure but it is not difficult. All you need is a big pot to hold the jars covered in boiling water, the jars, lids and the ingredients listed. Last year I had an abundance of pears on my trees and made a lovely pear relish, so you may want to “can” other fruits and vegetables. I had plenty many tomatoes last year and made a couple gallons of home-made tomato sauce, which was a blessing. It is not difficult to “can”, so, yes you can “can”. You can start with these Sweet and Tangy Pickles; you won’t believe how great they taste, on sandwiches, with bread and butter or right out of the jar like bro’ in law. * Look for pickling type cucumbers; they are smallish with “bumps” on them. Most importantly be sure they do not have a wax coating on them. I mention pickles in this week's Hodgepodge. Will have to give these a try! I like any kind of pickle. We're building similar plant wooden thingies (not sure what they;'re called) for the kids to teach them about plants, responsibility, following through to the end, and of course eating the rewards. LOVED this post!!!! Very very clever!!! Wonderful pictures... I loved the pickle...so full of flavours! loved the humour of jars. I miss the pickles here...will definitely try this recipe. i have been seeing a lot of people answering the pickle questions today--these sound great! JOYCE: I like a lot of different pickles too but these particular ones are just about my personal favourite. STEPHEN TREMP: I am happy to hear about this, it is a good teching tool (photosynthesis, chlorophyll etc)and if you grew it, you more likely want to eat it. With the price of capsicum, I'm glad I'm growing my own bell peppers. PURABI NAHA: Thank You, these crisp, tangy pickles are a great aperative and taste wonderful. DELICIOUS ADVENTURES: I hope you do try these, they are seriously good. SUSANNE DRAZIC: Thank You Susanne. 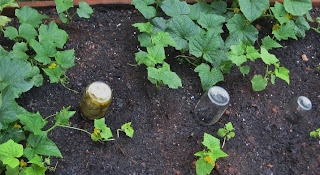 I am going to plant some jars beside my tomatoes and see if I get juice or sauce. BAYGIRL32: Thanks. I love these pickles. I have many memories of helping my Grandma and Grandpa "can" in the 70s. Many hot, boiling, scalding memories. Fond memories? Not so much. Bunnies have taken over our garden, only now I think I need to make pickles. Lots and lots of lovely pickles. delicious pickle with cucumber !! !n a must try for me :-)bookmarked !!!!! Ooh, yum :) I'm a sweet pickle fan myself. DAWN @ lIGHTEN UP: I regret that your early canning experience was scalding, I only started a year ago and it was not difficult.I suppose canning is not for everybody. GENE POOL DIVA: We have a rabbit on our grounds, I see him on the front lawn and when he notices me he freezes. I think he is the one who is eating my raspberries and strawberries. I like to see him (or her, I didn't get that close) on the lawn though. Pickles are good and I like to drink a jigger of the pickle juice every couple of days. SONALI: These pickles are delicious, either on sandwiches or in tuna salad or egg salad or just plain out of the jar like my son-in-law likes them. Please enjoy them. COOKING VARIETIES: Thank You, I have three other plots like that.These pickles are really good. I never have tasted any store-bought as good. Regards. SARAH ALLEN: You would really like these. That sounds like a great recipe, but I think I am going to get the ones that grow straight into the jar! 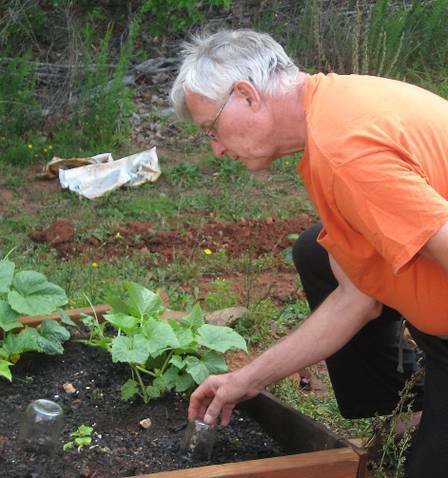 LYNDA R YOUNG: Weeds are a hassle. I'm pulling them all the time from my other plots. Thank you for your kind words, your blog is impressive. MALLI: Yes, it is nice. This morning I processed some peaches from my trees into peach preserves, which is great to use when making barbecue sauce. MISHA GERICKE: The pear relish is chopped pear in a sweet and spicy vinegar. I spread it on bread for sandwiches, so yea, I assume it is like a chutney. OLYMPIC STATION PARK: Thank You. You are one of the clever. And here, I was buying my jars. I haven't tasted a sweet/tart pickle in almost forever. I used to love them with a certain pasta/hamburger dish I made when my kids were little and money was scarce but everyone always cleaned their plate, which meant they liked it. MANZANITA: From time to time I used to purchase bread and butter pickles at the store and they were fine, until I started making these. I slice them a little thickly which means I have to slice them in half to put on sandwiches, but I don't mind a bit becaiuse they are that much good. LIZZY: When you do you will want to do it all the time. Forget about the pride of making them, or the savings in price; they are just so very much better. A friend said I just look for reasons to stay in the kitchen longer but I just love making these pickles, and my daughter's spouse is crazy about them. SUSAN FLETT SWIDERSKY: Canning is not difficult, directions are everywhere. And yours with onions, oy, they going to be good yea.